Ghee is an important part of Ayurvedic Medicine and Indian cooking. Ghee is “clarified butter”. The process takes unsalted butter and boils it to remove the milk solids. Through this process, it leaves behind its golden oil. There are truly some amazing benefits of consuming ghee. Ghee has one of the highest burning temperatures of most oils. It has a flash point of 485 degrees F., which makes it a great oil to use when cooking. In Ayurveda, ghee is often used as a carrier for herbs and to lubricate the gastro-intestinal tract and all the tissues in the body. Oleation with ghee helps pull fat-soluble toxins out of cells and triggers fat metabolism (where the body begins to burn its own fat as fuel). What Makes Ghee so Special? Ghee is made from butter. The primary fatty acid in butter is butyric acid. Butyricacid, or butyrate, is a short-chain fatty acid (SCFA) that the intestinal tract thrives on. It helps to protect the integrity of the gut wall lining. A healthy gut makes butyric acid. When we eat healthy fiber our gut microbes convert the ingested fiber into butyric acid. The cells of the colon use butyric acid as one of their main sources of energy and their main way to support the health of the intestinal wall. Research has shown that patients with unhealthy digestive tracts do not produce butyric acid and have other low levels of fatty acids or related oils. This is why ghee can be an amazing way to heal the gut. In a comprehensive study, butyric acid not only has benefits for the digestive system, but other areas of health. Ingesting ghee whether for culinary purposes or as a carrier oil for nutrients in herbs, serves to lubricate the gastrointestinal tact and all the tissues inside the body. Eating ghee not only makes your taste buds happy, it keeps you fueled throughout your day and makes beneficial bacteria in your gut, the center for digestion and assimilation, where the production of mood-regulating neurotransmitters and a strong immunity are made. We believe ghee is the way to go! 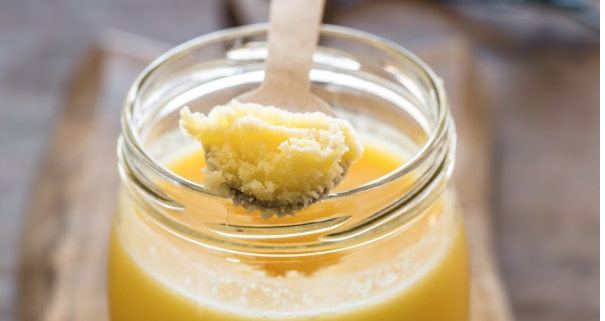 You can make your own or purchase organic grass-fed ghee!